Environmentalism History: Theodore Roosevelt was the 26th American President who served in office from September 14, 1901 to March 4, 1909. One of the important events during his presidency was the emergence of the philosophy of environmentalism during the Progressive era in American history. Summary and definition: Environmentalism is a belief that the natural world including animals, birds, fish, plants, trees, water, air and and other natural resources are sacred and should be protected from destruction or pollution. Environmentalism encompasses a passion for nature and a conviction that humans are intruders who should be able to look, but not to interfere with, the environment. Environmentalism played an important part within Progressive Movement (1890 - 1920), that covered a wide range of social reform issues, and was closely associated with the Conservation Movement. 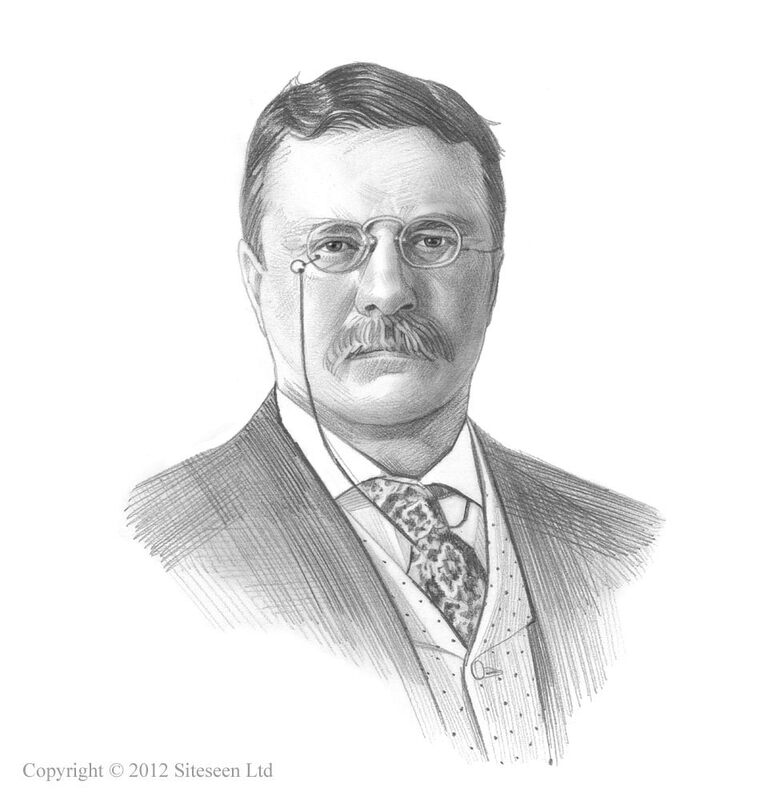 President Theodore Roosevelt was an ardent conservationist during the Progressive era. His political goal was to prevent unscrupulous Robber Barons from exploiting and squandering the natural resources of America. He believed that natural resources and nature should be protected from the devastation and destruction wreaked by these uncaring and uncompassionate men. The basis of his belief in conservation was that the natural resources of America should used in an efficient, orderly and planned manner to avoid waste, pollution and exploitation. Advocates of environmentalism adopted a more extreme philosophy believing that all nature was sacred and that man were intruders, who should be able to look, but not to interfere with the environment. President Roosevelt walked a fine line between Conservation and Environmentalism. He sought to regulate big businesses associated with the natural resources of America, without destroying their economic efficiency. His progressive reform programs led to his "Square Deal" domestic policy in which he pledged not to favor any group of Americans but to be fair to all. His intention was to "substitute a planned and orderly development of our resources in place of a haphazard striving for immediate profit." To this end he implemented progressive and aggressive political reforms, including the heavy regulation of business as well as supporting the conservationists and environmentalists by preserving the untouched wilderness and establishing nature reserves. Environmentalism was responsible for alerting the American public to the consequences of American policies and industries that were destroying the 'Land of the Free". The causes and reasons for Environmentalist movement have their roots in the history of the United States. The events in Environmentalism History start with the policy of Westward Expansion and the notion of the Manifest Destiny. The United States acquisition of vast tracts of land, the sheer size and enormous potential of the North American continent led policy of continuous Westward Expansion. America offered a range of different features; trees, vegetation, animals and raw materials. The potential of the new resources and the massive areas of free land motivated Americans to move west. The early settlers were inspired by the belief that the Manifest Destiny of the United States was God's will and a divine right of the American people. Westward Expansion would not have been achieved at such a fast rate had it not been for new transportation systems. The era of road building enabled the first settlers to travel along the Cumberland Road and pioneers established the Santa Fe Trail and the Oregon Trail, the major gateways to the west. The lands once occupied by Native American Indians and Fur Traders saw the influx of new settlers. The economic policy of the 'American System' was adopted that created a subsidized transportation infrastructure of new roads and canals. The Erie Canal linked the Atlantic coast and New York to the Great Lakes and allowed the passage of boats inland carrying produce and passengers. The invention of steam engines result in Steamboats appearing on western rivers. And then the era of the Railroads began. The Transcontinental Railroad was completed in 1869 joining the eastern and western parts of the United States. The transportation systems that developed in the United States had a massive impact on the environment and played an important part in Environmentalism History. The new forms of transport would not have been possible without the Industrial Revolution Inventions. The Industrial Revolution inventions had a massive impact on the environment. America was brimming with natural resources but needed mills and factories to make manufactured goods. There were enormous changes in agricultural and manufacturing processes that led to the mechanization of industry and the Industrialization of America. The Industrialization in America saw a huge impact on the environment and played a major role in the pollution of the country. The economic system of Free Enterprise and Laissez-Faire resulted in the accumulation of massive wealth by the Robber Barons and the Rise of Big Business and Corporations. The natural resources of America were exploited by men who cared nothing for the environment or conservation, they were driven purely by profit. They developed a "tradition of waste" that was devoid of proper planning or foresight. The Mining Industries extracted natural resources such as coal, iron, copper, gold, silver and oil. The mining companies used inefficient and wasteful mining practices devoid of government regulation. The timber and logging industries used unplanned and destructive methods, often leading to uncontrolled forest fires. The railroad companies and land speculators purchased vast tracts of lands and forests that they destroyed in their quest for wealth. Factories and the Factory System was established to produce all types of goods and Americans moved from a rural, agricultural environment to an urban, city environment during the Industrialization of America which in turn led to terrible pollution during the Urbanization of the United States. The rapid Urbanization in America, sparked by the process of Industrialization, led to the development of cheap accommodation in dark, crowded, unpleasant and unhealthy living conditions. Pollution and poor sanitation led to deadly epidemics in the towns an cities. There was a lack of adequate waste disposal systems resulting in large amounts of untreated waste and raw sewage. The lack of adequate sanitation led to the contamination of the water supply and triggered deadly epidemics of cholera and typhoid fever. Pollution was a major factor of Urbanization as horse waste was left in the streets and the smoke that belched from the factories polluted the air. The problems of pollution were largely ignored and the ever increasing demand for cheap labor saw the unprecedented rise in Immigration. Between 1881 and 1890 a total of 5,246,613 immigrants arrived in the United States. This explosion in the population due to the unprecedented Immigration levels impacted the environment and the lack of planning added to the problems of over crowding and pollution. The harmful aspects of increased population and human activity led to pollution, degradation of the environment, and the depletion of resources. In 1890 people started to clamor for reform which saw the beginning of Environmental Problems. The problems in America led to the Progressive Movement (1890 - 1920) that encompassing many pressure groups and reform movements including the Conservation Movement and the Environmentalists. The members of the Conservation Movement and the Environmentalists, with their philosophy of Environmentalism, were galvanized into action by the realization that the America they knew and loved was disappearing before their eyes. The Environmentalists responsible for awakening the conscience of Americans and promoting the philosophy of Environmentalism are detailed in Famous Environmentalists. The Environmentalism History provides interesting facts about American Environmentalism History. 1807: Steamboats revolutionized river travel and river trade. 1832: Hot Springs Reservation was the first area to be designated for government protection. 1836: Ralph Waldo Emerson defines the ideals of American conservation and Environmentalism in his 1836 essay entitled "Nature". 1851: Henry David Thoreau delivers a speech declaring that "in Wildness is the preservation of the World." 1881: Immigration - Between 1881-1890 a total of 5,246,613 immigrants arrived in America. 1892: John Muir founds the Sierra Club that is dedicated to the preservation of wilderness. 1893: Frederick Jackson Turner publishes "The Significance of the Frontier in American History." 1902: Congress passes a bill establishing Crater Lake National Park, Oregon. 1903: Congress passes a bill establishing Wind Cave National Park, South Dakota. 1904: Law passed that leads to the establishment of Sullys Hill National Park, North Dakota. 1906: Congress passes by "An Act For the control and regulation of the waters of Niagara River, for the preservation of Niagara Falls, and for other purposes"
1909: Congress passes "An Act To create the Calaveras Bigtree National Forest"
1909: President Roosevelt issues a Proclamation establishing Mount Olympus National Monument, Washington.